The twenty-first century offers more technology than we have ever seen before, but all that "help" can be overwhelming. With new updates coming out all the time, from Windows 10, the Anniversary Update, the Creator's Update, and now the Fall Creator's Update; most computer users don't have time to keep up or figure everything out on their own. 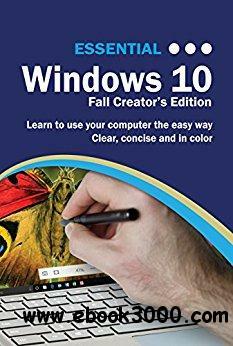 Unlike manuals that assume a computing background not possessed by beginners, Essential Windows 10 Fall Creator's Edition tackles the fundamentals of Windows 10 so that everyone from students to senior citizens to home users pressed for time can take advantage of the digital revolution. So if you're looking for a windows 10 manual, a visual book, simplified tutorial, dummies guide, or reference, Essential Windows 10: Fall Creator's Edition will help you maximize the potential of Windows 10 to increase your productivity and enhance your digital life.